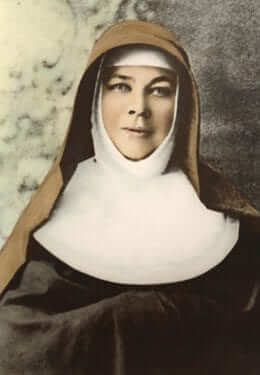 Mary MacKillop is in the company of all the great mystics here. It’s very human to kid ourselves that, if we flee the pressures that weigh us down, then touching the face of God would be possible. We yearn for somewhere quiet and peaceful, but if God is truly God, then the Divine Presence is always with us. Yet we keep wanting to look in other places. We can be unaware of the sacredness of where we are. We overlook the need to go inside ourselves, to seek the God within. We wait for God to come to us, but, as Mary points out, God is always with us. It’s all about growing in awareness of this. See the hand of God in all that happens – hard as that may sometimes be! Happiness is very much an inside job, but we depend so much on each other for happiness, especially in marriage, both as givers and receivers. I can forget the indisputable fact that no one, no institution, no marriage, is perfect. Mary found her happiness in making others happy. Jesus had the same approach. It does mean living with imperfection – in ourselves and others.